Blaze is the type of teenager I always imagined I was, when I think back to those years. She is sarcastic and at the same time she has her insecurities. I guess that's pretty similar to a lot of teenagers, at least the insecurity part. I wasn't obsessed with comics like Blaze, but considering the father she had and the fact that he actually named her Blaze (it's not a nickname, folks), it's not really a surprise. 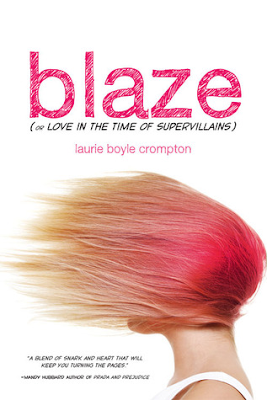 I knew I was going to love this book when in the first chapter we learn that Blaze is basically a soccer mom. She has the van, she carts her younger brother and his team to games, and she sits on the sidelines all season long. She's got the bumper sticker, too, but that's just because she's ironically cool. Blaze's crush, turned archnemesis, Mark wasn't really all that for me. I totally get how she could have a crush on him. He's the hot popular jock and he coaches kids in soccer, but he wasn't really all that for me. It was definitely more fun when he reached archnemesis status. Even though you didn't really feel Mark at the beginning, I'm glad he worked out as an archnemesis! ;) I think Blaze definitely sound relatable for me, especially because I'm super sarcastic yet have some of my own insecurities, you know? I love it when I'm able to connect a lot with a character, and I think I'd be able to really connect with Blaze. This book really does sound awesome and funny, and I seriously can not wait to pick it up!